When an earthquake occurs, the shock sends outward vibrations in all directions. SEISMIC WAVES ARE DETECTED AND RECORDED BY INSTRUMENTS CALLED SEISMOGRAPHS. A heavy weight is attached to a base anchored in the bedrock. The weight stays still even when an earthquake starts. A record sheet called a seismogram is put on a rotating drum attached at the base. The drum turns slowly. A pen rests on the drum. When everything is cool, the pen makes a straight line. When an earthquake starts, the pen makes a jagged zig zag. THE ZIG ZAG TRACINGS PRODUCED BY A SEISMOGRAPH ARE CALLED SEISMOGRAMS. THE FIRST GROUP OF LINES RECORDED ARE ALWAYS P WAVES. THE SECOND GROUP OF LINES RECORDED IS ALWAYS THE S WAVE. The larger the zig zag the stronger the earthquake. The distance the pen travels from the center calm line is related to the size of the earthquake. How do we Use Seismograms? Page 11 of the ESRT shows us information about seismic waves. 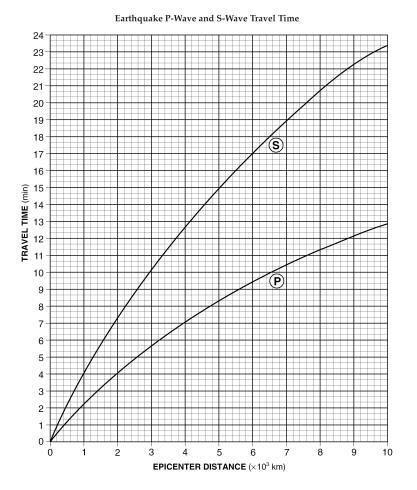 We're going to learn how to use this to answer a number of different regents questions, so lets get familiar with the graph itself. THE X-AXIS OF THE GRAPH SHOWS US DISTANCE TO TEH EPICENTER IN 1000S OF KM. EACH SMALL LINE ON THE GRAPH = 200KM. THE Y-AXIS OF THE GRAPH SHOWS US TRAVEL TIME IN MINUTES. 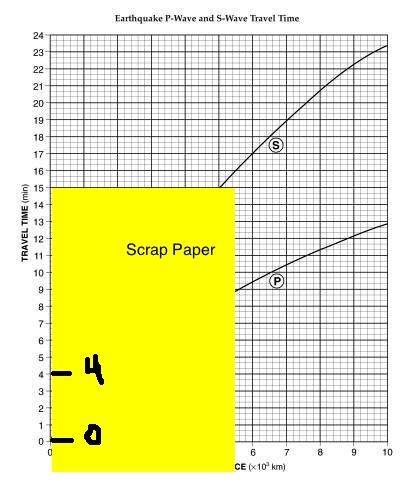 EACH SMALL LINE ON THE Y-AXIS = 20 SECONDS. To find the travel time, we must know the distance the wave has traveled. You will be given this information in the question itself. Let's Practice: How long does it take a P-wave to travel 4,000km? This is just the reverse of what we just did. The question itself will tell you the travel time, and you must use it to find the epicenter distance. Let's Practice: How far will an S-wave travel in 5 minutes 20 seconds? We can also find the distance to the epicenter by looking at seismograms. In this case we can find the distance to the epicenter by examining the difference in time between the arrival of the P wave and S wave. Let's Practice: Which of the seismograms to the right is the closest to the epicenter? Choice 4 - Waves are 4 minutes 40 sec apart. Choice 3 is the closest to the epicenter! Sometimes we will be given just one seismogram, and be asked to find exactly how far it is from the epicenter. When we analyze seismograms, there are only 2 points of interest for us. The only points that matter are the arrival of the P wave and S wave. The arrival of a wave is where the seismogram first begins to zig zag. 2. Line up a piece of paper with the travel time axis of the ESRT. 3. On the paper, mark 0 minutes and the difference in arrival ties you just found. 5. Follow the edge of your paper straight down to find the distance to the epicenter.